Last week was big. It was a milestone. It felt a little weird. It was my 30th birthday. I am no longer a 20 year old. I have told myself that I am never going to start dreading my birthday. I'm going to enjoy it, use it as an excuse to go out for dinner, celebrate, and most importantly - eat cake. (And go on vacation! Took a few days off to head up north for some fun, more in a later post!) When I was younger I wasn't always a huge fan of sharing my birthday every single year. However, now I think it's pretty much the best thing ever. I always have someone to celebrate with, someone who is just as excited as me, and someone to help bake a cake with! For our 30th birthday we wanted to do something we hadn't tried before, flavor wise. Lara had recently seen a recipe for a pistachio with roasted plum frosting and when she mentioned it to me I thought it sounded wonderful. Not only is it a unique combination, it is also plum season, and I happened to have picked up a pint of black plums at the farmers market the week before and had a few left. It was meant to be! It was the absolute right decision. The cake turned out amazingly! It was so delicious and fun to share with family and friends. 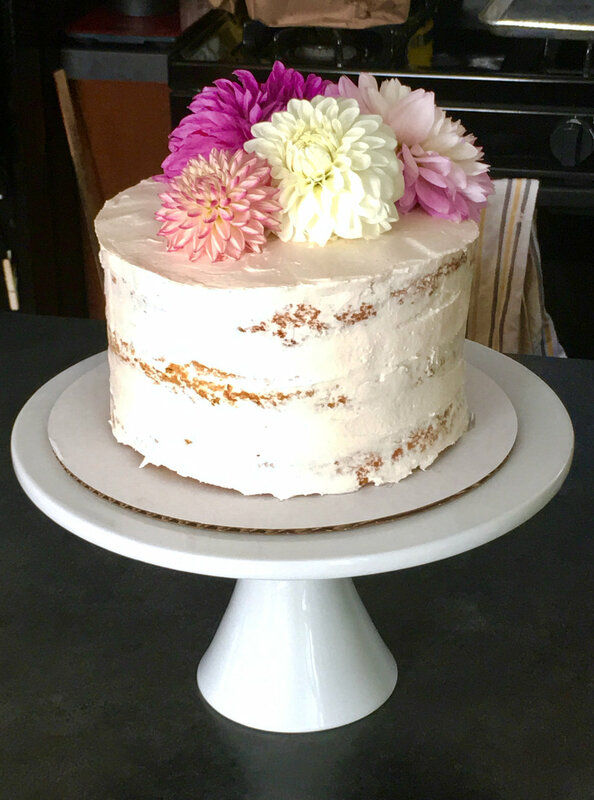 Last year we came up with the idea of decorating our birthday cake with real flowers instead of spending a lot of time trying to decorate with frosting and then not liking the results. 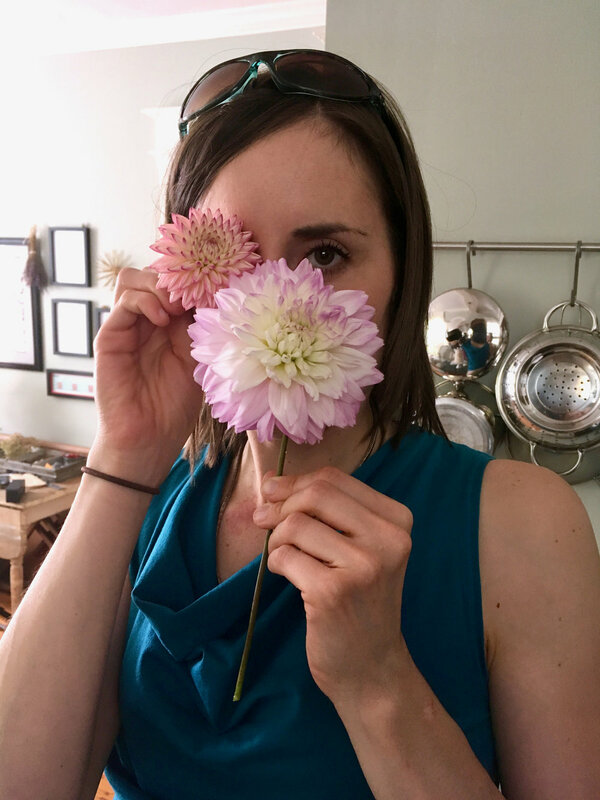 Since our birthday coincides with dahlia season, I have a feeling that dahlias are going to be making a fairly regular appearance on our birthday. They are absolutely gorgeous and come in every size and color. Why waste your time decorating a cake when God has already perfected these beautiful flowers. Win-win! For this cake I had to make a special purchase of pistachio paste. Something I have never actually seen. I found a source online (thankfully I had been looking at birthday cakes the week before my birthday, so I had time to have them ship it to me). In the original recipe, the author gives a recipe for homemade pistachio paste, but I just didn't have any desire to do that, so I "splurged" and bought it online. I was expecting it to be a lot like almond paste which I have used quite a bit and is thick and solid, you can cut it into "slices" if desired. The pistachio paste was very runny, very much like natural almond butter than you might have. It really seemed more like pistachio butter than pistachio paste, but it was sweetened. Other than that one ingredient, the cake was a pretty standard butter cake with a little citrus zest (I went with orange) for brightness, and yogurt for moisture. I'm sure you could do sour cream instead if desired. The original recipe called for an Italian Meringue buttercream, but I didn't feel like doing that this year so I just went with a standard American buttercream which is also very delicious. My frosting did not get as purple, or "plum" colored, as the original. Perhaps due to the change in frosting, or maybe because I peeled my plums, which was a little disappointing. I liked the pale purple of the original. But in the end it still turned out wonderful and delicious. 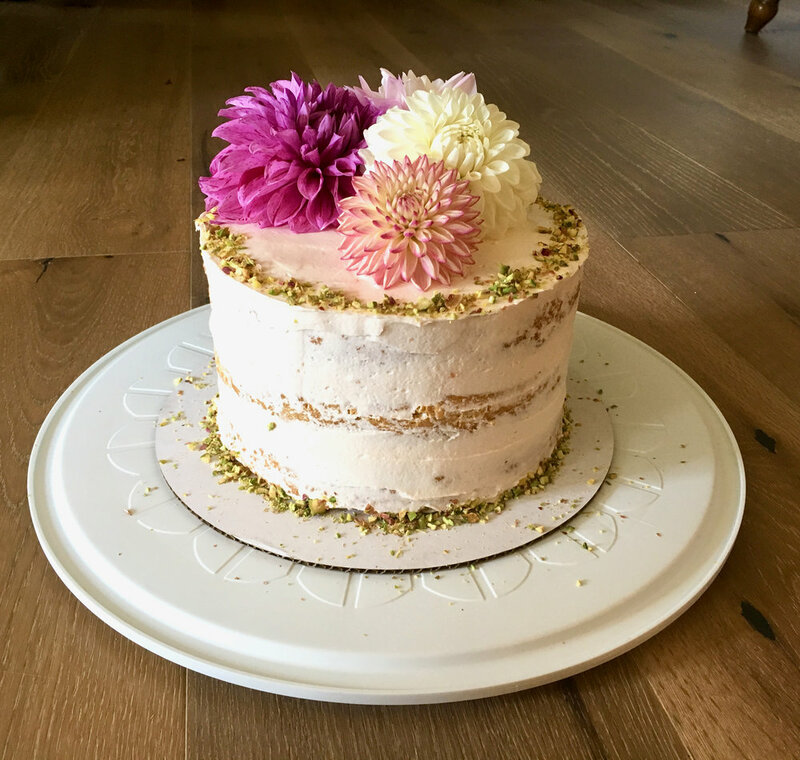 I decided to try a "naked" cake look this year. Wasn't sure how I would like it, but actually found it really easy. It was nice to not have to worry about crumbs on the side of the cake, and to not have to be a perfectionist trying to get the edges perfectly smooth. A great technique for the lazy cake froster! A few flowers on top and some crushed pistachios and I was done! Another year, another successful birthday cake! Went out for dinner the night before our birthday and got to watch the sunset over the lake on an absolutely gorgeous night, followed by ice cream obviously! Birthday brunch at our favorite place! Croissants and lattes - what more could one want! So excited to finally dig in! A beautiful triple layer cake, with a subtle tinge of green. It was dense and buttery and moist and absolutely delicious, just how I like it! To roast the plums: Preheat your oven to 400 degrees. In a small baking dish, toss together the sliced plums, sugar, balsamic vinegar, salt and water. Roast for 15 minutes, or until the plums are super juicy and a syrup has formed. Set aside to cool slightly, about 5 minutes. Add the plums and its juices to a blender and pulse until completely pureed. Pour through a strainer, into a small bowl. You should end up with about 1/3 of a cup puree. Set aside to cool completely, ideally in the fridge. If it is warm at all when added to the frosting it may melt the butter. To make the frosting: In the bowl of a stand-up mixer with the paddle attachment, add the butter Beat for 30-60 seconds, until nice and creamy. Add the powdered sugar and beat for 2-3 minutes until well combined. Add the cooled plum puree and vanilla and beat until well combined. To bake the cake: Preheat oven to 350 degrees F. Butter and flour three 8x2-inch cake pans. Line the bottoms with a round of parchment. Set aside. Divide the cake batter amongst pans, smoothing out the top with a spatula (the batter will be a little thick so it'll need some help smoothing out). Transfer to the oven and bake for 30 to 35 minutes, or until a a skewer inserted into the center comes out clean. Cool the cakes in their pan for 10 minutes before removing them to cool completely on a wire rack. To assemble: place the first layer of cake on a cake board or a cake stand. Add about 1/4 cup of frosting the top of the cake layer and smooth it out, pushing it out to the sides. Add the second layer on top and then add a second 1/4 cup to the top of that. Smooth out the top and add a nice thin layer all the way around the sides of the cake. Transfer to the freezer to chill for about 5 to 7 minutes. This is the crumb coat. Add a second even layer on the outside. Transfer to the cake to a baking sheet and decorate however you would like! Slice and serve!